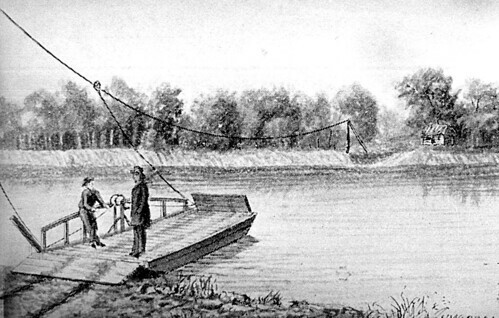 In the early 1840s, some upstart Canadians—the Pappan brothers (also spelled Papin and Papan)—thought it would be a good idea to set up shop along the Kansas River. Their trade? Ferrying travelers across the wide Kaw (Kansas) River. One wagon at a time, pioneers paid a dollar to cross a couple hundred yards of rushing water so as to continue their journey. The wagons would sit on a log platform while the ferrymen propelled the ferry with a long pole; a rope slung the whole way across the river helped guide their way. The Pappans had two ferries in operation by the end of the 1840s, each able to support up to two wagons. They remained in business into the 1870s; during these decades, several hundred thousand pioneers chose to ferry their wagons instead of caulking and fording, and the Pappans serviced a good portion of them. Until the bridge, that is. At any rate, [the genius who first engineered the huge rope from side to side across the treacherous gulf] is passed and his labor lost, through the existence of a spiderish iron bridge as ambitious as the hopes of the two towns it unites, and having in it no suggestion of the good old times when Pappan pushed and poled his ill-contrived scow from shore to shore. Distance ahead to Fort Kearny: In the game, pioneers would be on the trail for 119 miles before hitting Fort Kearny, Nebraska. In our car in 2011, our route took us 279 miles, because we followed those pesky highways that have been put in place. However, based on the OT diaries we’ve read, we saw a dinosaur and the pioneers didn’t. Wait, what? Stay tuned! 3 Comments to "Crossing the Kansas River"
Ha! No, we did our trip in 3 1/2 days in August…we’re just really bad at writing the posts. 🙂 It’s a really great trip — we did a sort of subset of the trip specifically for our purposes (spots in the video game) but the National Park Service Auto Tour is a great guide. We want to do it again, seeing more of the spots than just the 18 we hit. 2 Trackbacks to "Crossing the Kansas River"